Wall of Remembrance to be built for Korean War veterans in Washington D.C.
Wall of Remembrance to be built for Korean War veterans in Washington D.C.. October. 18, 2018 07:33. by Sang-Ho Yun ysh1005@donga.com. The Korean Veterans Association (KVA) announced on Wednesday that it will commence a donation drive to build the Wall of Remembrance in the Korean War Veterans Memorial in Washington D.C. The Wall of Remembrance will be a round glass wall built around the "Reflecting Pool," with perimeter of 50 meters and 2.2 meters tall. On the glass wall, the names of some 36,000 U.S. soldiers and 8,000 KATUSA who passed away in the Korean War. 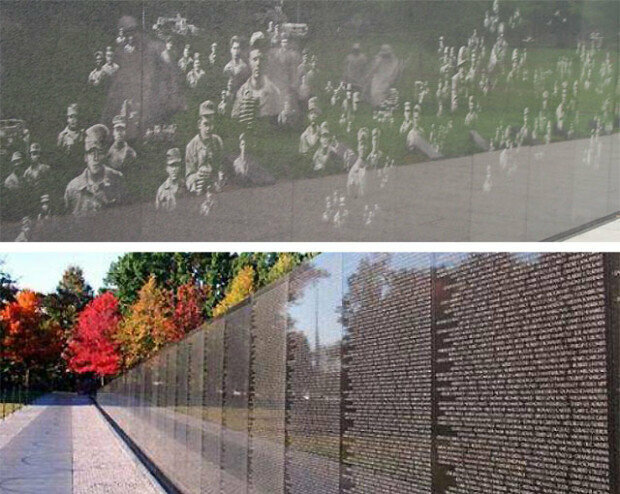 In the adjacent Vietnam Veteran Memorial, the names of some 58,260 soldiers who died in the Vietnam War are engraved in a monument in chronological and alphabetical order. The Wall of Remembrance will be built to cherish forever the heroes who answered to their nation’s calling and gave their lives to keep peace and justice in Korea. A total of 28 billion won is needed, of which 500 million won collected. The plan was jointly proposed by the Korean War Memorial Foundation and local Korean Americans and passed the U.S. Congress in 2016. “We need to raise 85 percent of the budget to obtain construction approval, as per the U.S. Commemorative Works Act,” said a KVA employee. The veteran association is planning to conduct a "Raise more than one dollar per person" campaign to its 1.5 million members by the end of the year. Companies and citizens are welcome to participate. Association executives, including Chairman Kim Jin-ho, visited the U.S. Western branch of the association early this month to host a roundtable meeting, raising 5,000 dollars (some 5.6 million won). Chairman Kim also made a personal donation of 10 million won. Presidential Chief of Staff Im Jong-seok also made a donation on behalf of the government, pledging to extend government support to build the monument. “We are leading the initiative to remember the sacrifice of 1.7 million American soldiers, their families and descendants and make members of the Korea Defense Veterans Association, who have worked in Korea since the war and contributed to the peace and stability of Korea,” said Chairman Kim.